Now, in an era of online shopping, mobile apps, and self-service checkouts, human interaction can get lost. 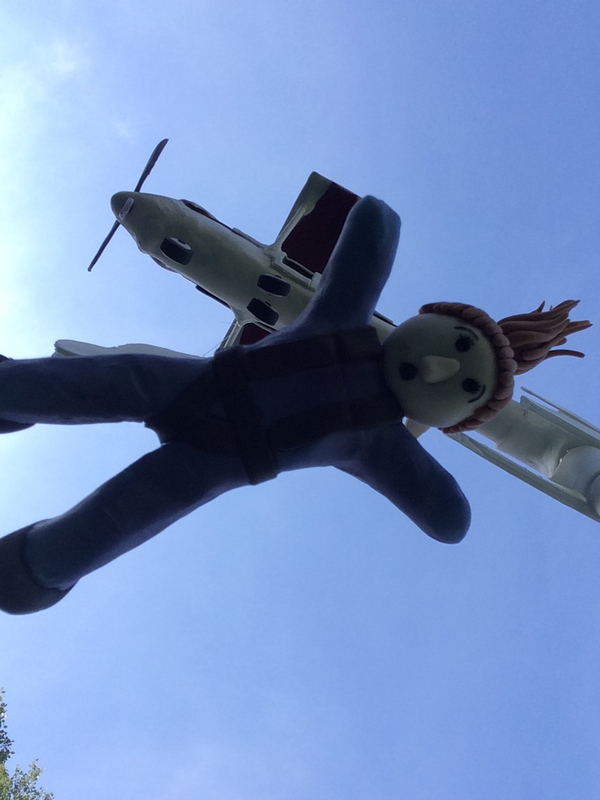 But it’s nice to know that a person can walk into Home Depot asking for something completely ridiculous, like suspending a cake in midair, and not only does the employee not laugh, but he springs into action. Our helpful associate paced up and down the aisle, deep in thought. In fact, for a moment, I became concerned that he had forgotten us completely, and had perhaps dozed off while staring at the PVC pipes. But just as suddenly as he had withdrawn into silence at the mesmerizing sight of neatly stacked white cylinders, he bounced to life and said, “I’ve got it! Follow me!” He led us around the store, gathering an assortment of gadgets and tubes. Since my primary knowledge of Home Depot had consisted of flowers, tomato cages, and the occasional foray towards the light bulbs, the cavernous aisles within were quite daunting. But he weaved us skillfully around, one display to another, until we had the tools we all agreed would support a plane made of chocolate. Is there something extraordinary about an employee helping a customer? Certainly not. But genuine happiness and good humour? The giving of one’s time without impatience? Joy and pride taken in one’s work? That is extraordinary. 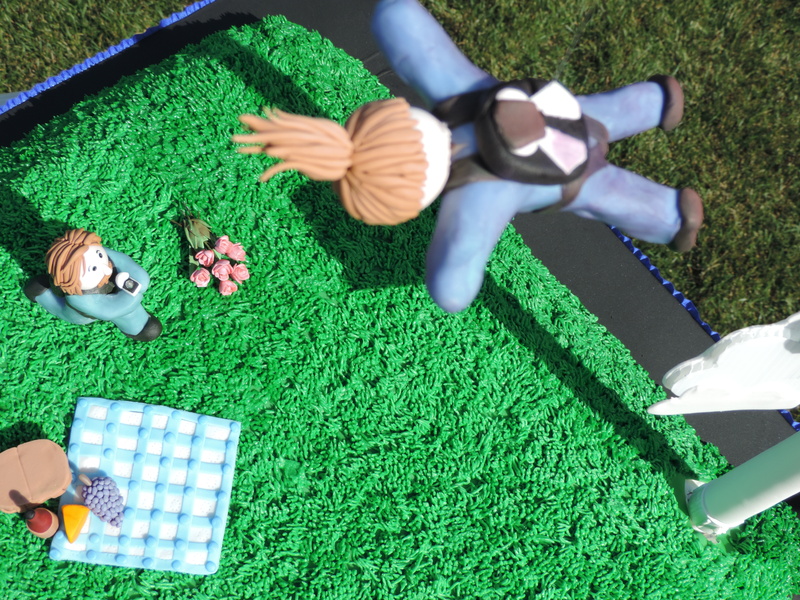 The trick with this cake was that I wanted the female skydiver to be suspended in midair. So before I could do anything else, I created her gum paste skeleton (these figures were created the same way the Blackhawks were created- gum paste torso, arms, and legs, and once hardened, covered in modeling chocolate). I tied fishing line around her torso, and the opposite end of the fishing line around the top of the PVC pipe. You can see the little gum paste figurine against the towel in the photo above. The next step was to create the plane. I threw some modeling chocolate on the PVC pipe and smoothed it around until it began to look plane-like. 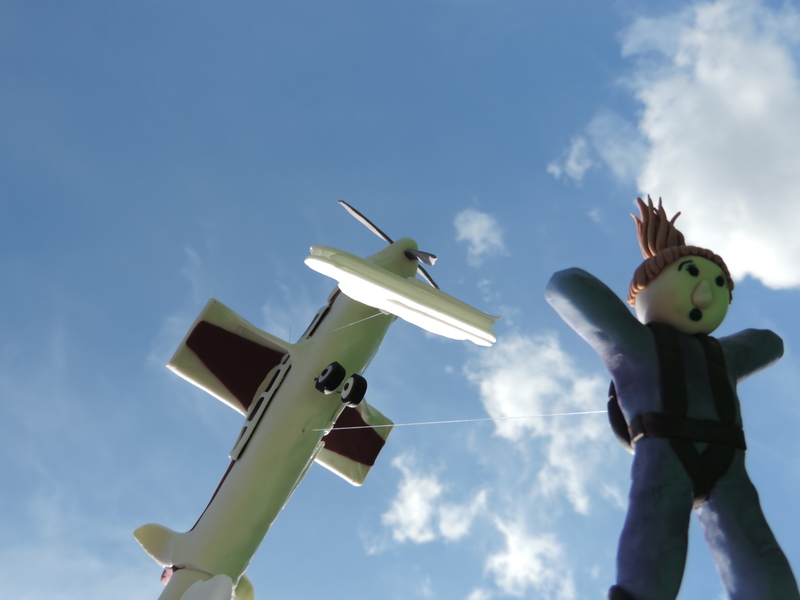 And of course, as always, the female skydiver was there, hanging out below. And next comes the cake! The wooden base was covered in black fondant, and then I put down a cake board. 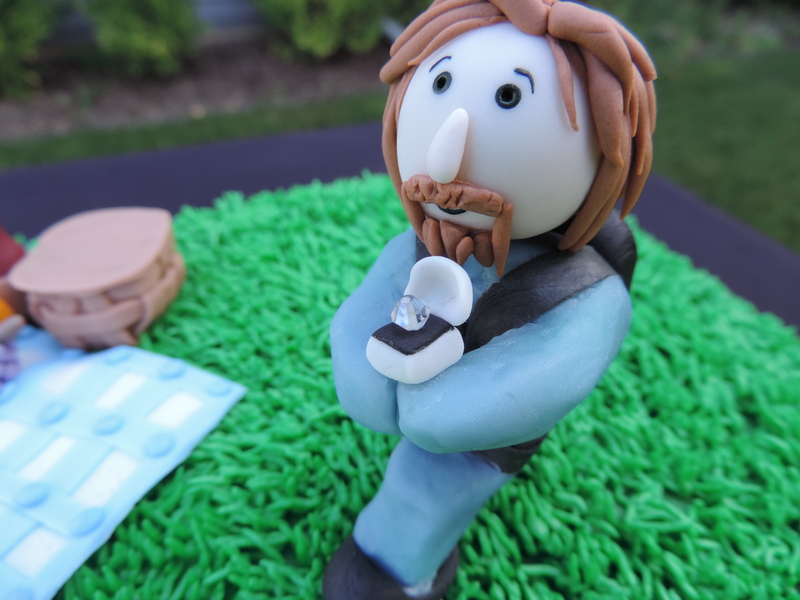 I then covered with several sheet cakes, cut up another sheet cake to make an angled side, covered with frosting and fondant, and then piped on the grass: And voila! 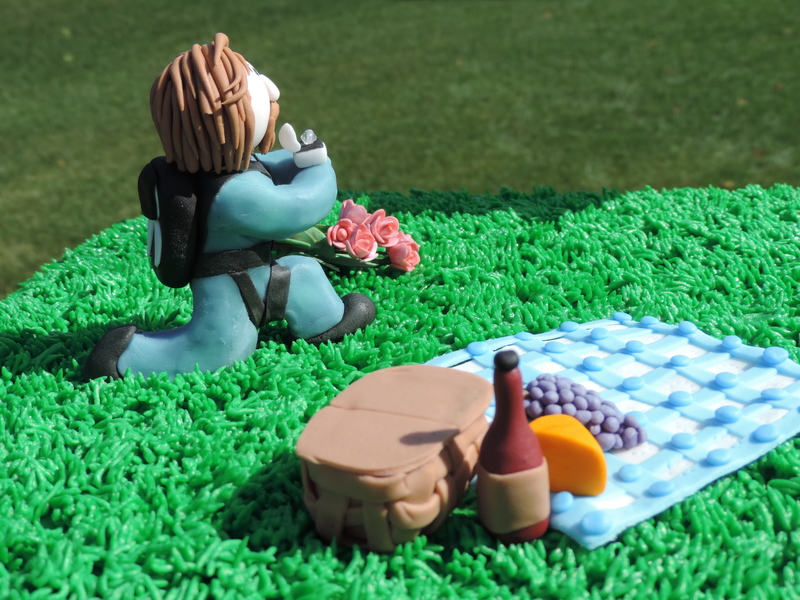 You have a skydiving cake! Another amazing creation and delightful story. Thanks for sharing your talent with the world!